The Dutch men’s team belongs to the best 16 during this WKC. They have won their poulematches against South Africa nad Lithuania. In the first round they had to take up the Swedish Men’s team. After exciting fights Sweden has won this match. But the men’s team didn’t leave without prize! Winston Dollee received a Fighting Spirit Award! 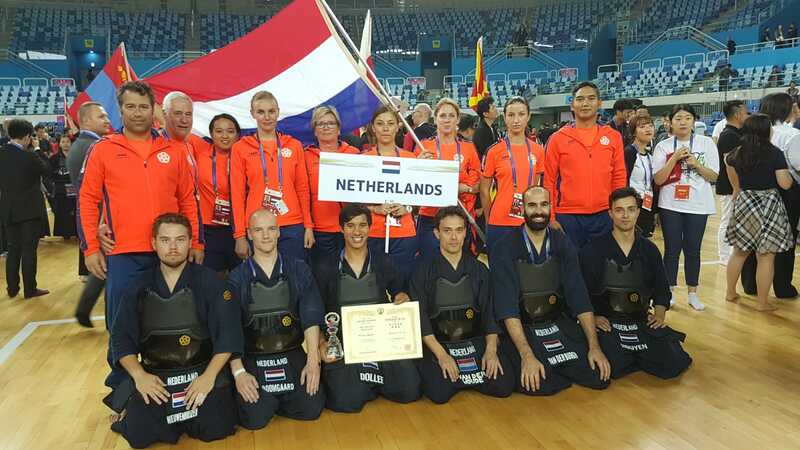 The Dutch ladies kendoteam have reached the quarterfinals (best 8!) during the WKC. They fought a good match against team Korea. Fleur Smout reached the best 16, and Sayo van der Woude made it to the best 8 during the individual women’s tournament. 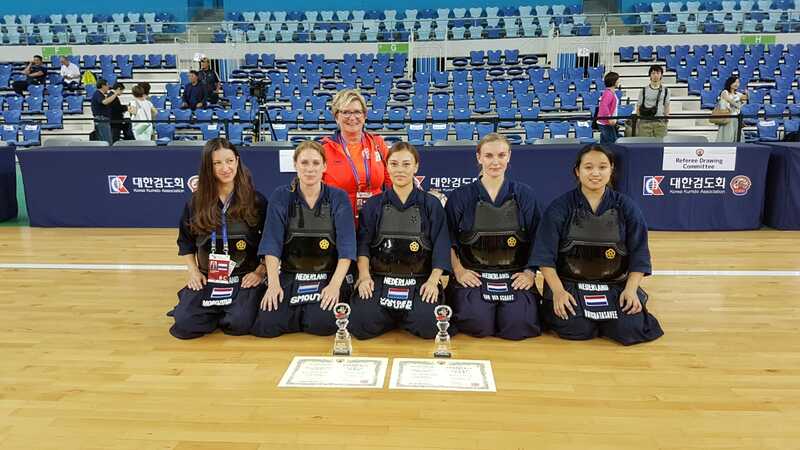 The Dutch lades did not finished without prize; Sayo van der Woude has been awarded the Fighting Spirit prize for both the women’s individual and team tournament. From left to right: Olga Morozova, Fleur Smout, Sayo van der Woude, Mariëlla van der Schans, Pakwan Ratchatasavee and in the back Joke de Jong (secretary NKR. We would like to know how you have experienced the seminar. Would you please fill in the following survey? 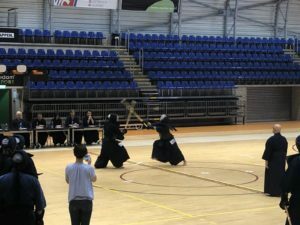 The kendo summer seminar is about to start. Besides the sudden relocation we have some traffic issues this weekend to take into consideration. The Coolsingel is blocked due to roadwork. This means that tram 23 doesn’t go via Coolsingel, but it does depart from Rotterdam Central Station. Please keep this in mind when traveling via Public Transport. Feyenoord plays an away-game in Eindhoven at 18:00 on Saturday the 4th of August. We will issue parking vouchers on Friday during the registration, please show this voucher on arrival on Saturday. Someone from the organization will stand next to the parking attendant to issue parking vouchers between 08:30 and 09:15 for the participants who start on Saturday. The parkinglot is only accessible via the Coen Moulijnweg on Saturday. Please arrive on time, we start at 09:30 on Saturday. 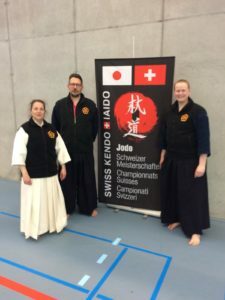 The Iaidoka below have passed their exam. These jodoka passed their exams on the 28th of July 2018. Saturday 28th July 2018 the Jodo Exams begin at 11:30. Due to the heat the jodo seminar will start an hour earlier on Friday 27th July; 09:00 instead of 10:00. Subscribing to one or all disciplines of the NKR’s calendars has been made easier. Changes in events are updated automatically in your subscribed calendar. You don’t have to doublecheck your and the website’s calendar to see if they are still in sync. Follow the steps in this YouTube clip to subscribe. 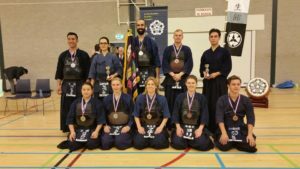 The Kendo Summer Seminar 2018 will take place in Topsportcentrum Rotterdam due to maintenance in Sporthallen Zuid Amsterdam. Visit the NKR website for updates. Registration for the Edo cup is open. 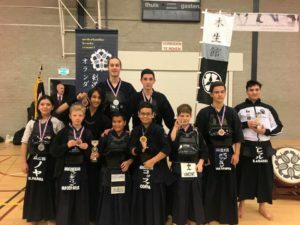 24 en 25 February the 29th edition of the Iijima Cup took place in Sporthallen Zuid Amsterdam, with again a record in contestants; 231 from 24 different countries. Saturday 24 February were the individual tournaments and Sunday the 25th was the team tournament. 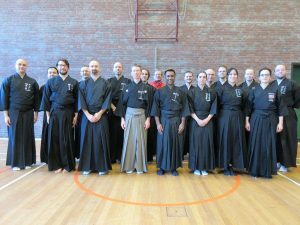 17 iaidoka, from sandan to godan, from 7 dojo, took part at the Iaido Referee seminar of the NKR on 14 January. 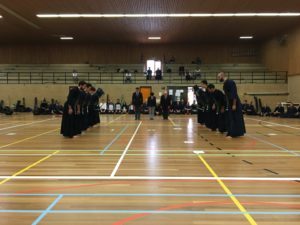 That afternoon they also were referee during the Iaido Mudan Tournament, also in Zoetermeer . This way the NKR works on thu current and future staff. Congratulations to all who have passed their exam. 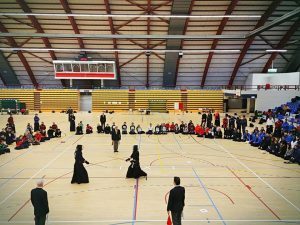 The deadline to register for the Dutch Championship Kendo is 14:00 today. See you Sunday and ganbatte!